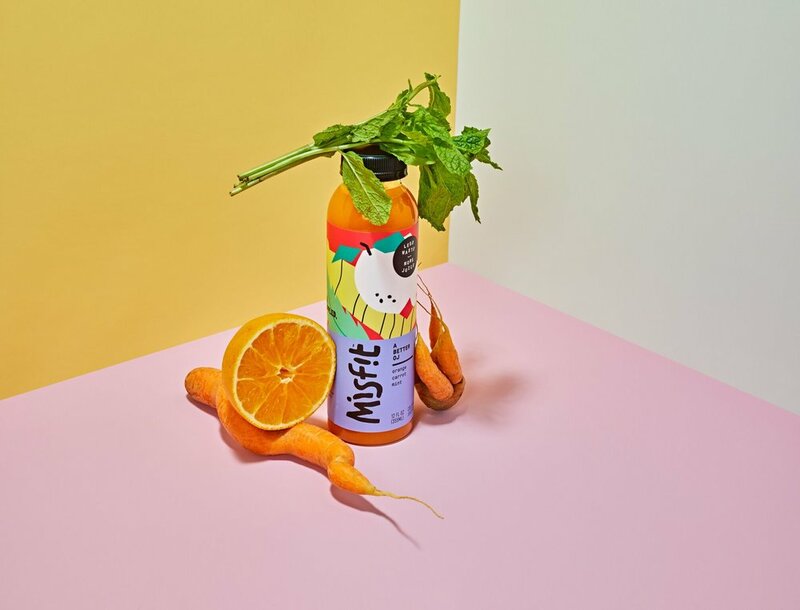 How much did you know about food waste before rebranding Misfit? We like to think we’re pretty savvy when it comes to sustainability. We recycle religiously, shop at a local food co-op, and even have an in-office compost bucket (ok, paper bag) for all our food scraps. But once we started on Misfit, we realized how little we actually knew about food waste and how much of the issue lies in the supply chain. We have seen the light and love that Misfit works so hard to educate consumers. How do you create playful branding surrounding such a serious issue? At the end of the day, we’re selling delicious juice. Yes, it’s making a big difference in the world, which is why we wanted to take this on, but it has to be tasty and inviting above all. No one wants to feel the weight of the world while they’re walking down the grocery aisle, so if we can invite people in and share the beauty behind Misfit’s mission then we’ve done our job. Where is the line between visuals that educate and visuals that lecture? For us this comes through in two ways: copy writing and photography. The content itself is very educational, but the way we created a playful photographic style and approachable language around these topics is what makes it so charming and approachable. We wanted to steer away from telling people to act a certain way, and instead invite them into the Misfit world. Tell us more about Gander's illustrated interpretations of misfit produce. Where did the idea of these cubist fruits and veggies come from? These illustrations were not meant to necessarily represent any style of art. We were really inspired by the fruits and veggies we were looking at, and tried tapping into the unique forms that they were presenting us with. Lumpy, curly, spotted- we wanted to represent the produce in a way that reflected their unique qualities. Using simple, geometric forms to illustrate the fruit allowed us to create scalable patterns and bold shapes to be used throughout the brand system. What misfits inspire the Gander team? We admire anyone who trusts their instincts and is making meaningful work. As a design studio, we obviously love all the crazy designers who have carved their own path in this space and continue to challenge expectations (the Sagmeisters of the world). Beyond that, Elizabeth Warren, Dave Eggers, Dr. Paul Farmer who helped found Partners in Health...Tonya Harding?! Ok maybe Tonya is questionable, but anyone who gives a big ole middle finger to status quo is alright by us. We love singers who can't really "sing." Tom Waits, Tyler the Creator, David Berman of the Silver Jews, and Bob Dylan are some faves. Also D.R.A.M. and Lizzo for their pure love for themselves- it's intoxicating. And finally, what's your favorite Misfit juice?